UPDATED: 4/14/2019: Since this article was originally published I’ve been back to visit San Francisco. I’ve updated this post with some additional awesome places to eat. Last month my husband and I spent a last-minute getaway weekend to San Francisco. I chose SF because the tickets were crazy cheap for the weekend and the hubs had been dying to get some of that ocean breeze we just don’t get here in Denver. On top of that, San Francisco is definitely a foodie town, so I was looking forward to some top-notch eats. I scored us an amazing Airbnb rental in the Mission District (that I cannot say enough nice things about) and we were off! It’s no secret that I love ramen. I did a ton of research on Yelp trying to find the perfect place for me to get my ramen fix. 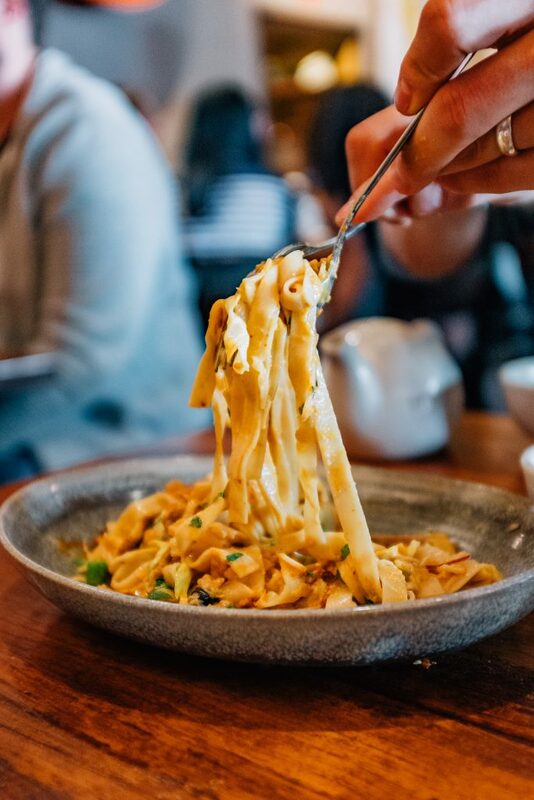 I chose Nojo Ramen Tavern because they specialize in my favorite type of ramen, chicken paitan. The reviews say this place gets pretty busy, so as soon as we dropped off our bags at the Airbnb we headed over to Hayes Valley, arriving maybe 30 minutes after the doors opened at 5pm. We were lucky and were seated immediately in the jewel box of a restaurant with its modern, elegant decor and floor-to-ceiling windows. I’ll admit, we went a little crazy with the ordering and even still did not get to try everything I wanted to! 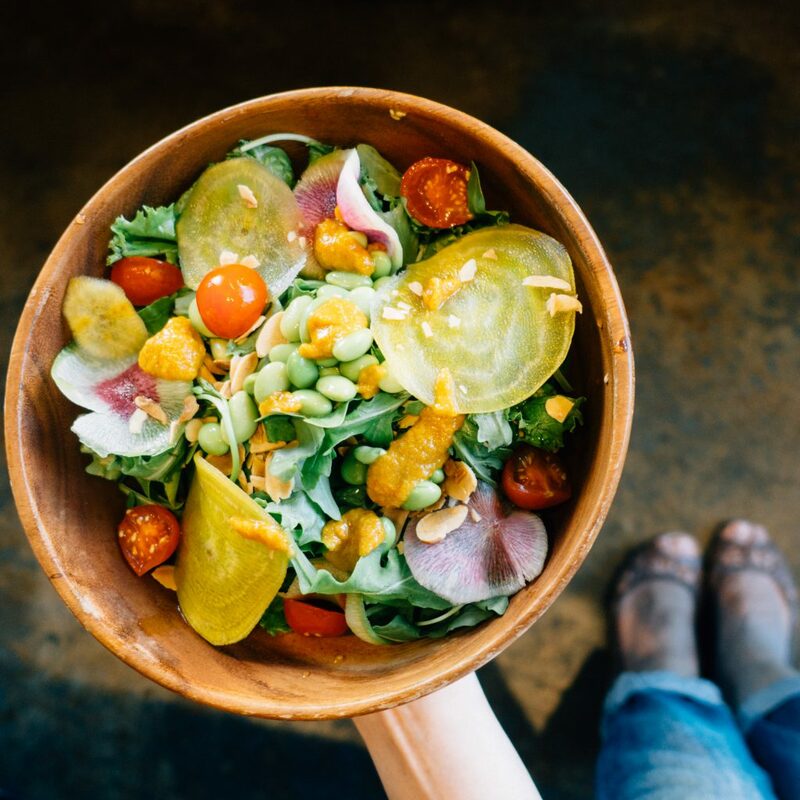 We started off with the Nojo Salad, an incredibly beautiful and delicious bowl of mixed greens, golden beets, cherry tomato, watermelon radish, edamame, almonds, with veggie garlic anchovy dressing on the side ($12). That orange dressing had a bit of a nutty taste to it, but still had a zesty acidity to it and was absolutely yummy. The greens were incredible and everything was so flavorful due to the freshness. Next, we had the Spicy Hamachi with Green Onion ($12) which featured some positively lovely slices of yellowtail with jalapeno, sesame seeds, and a sweet chili ponzu. 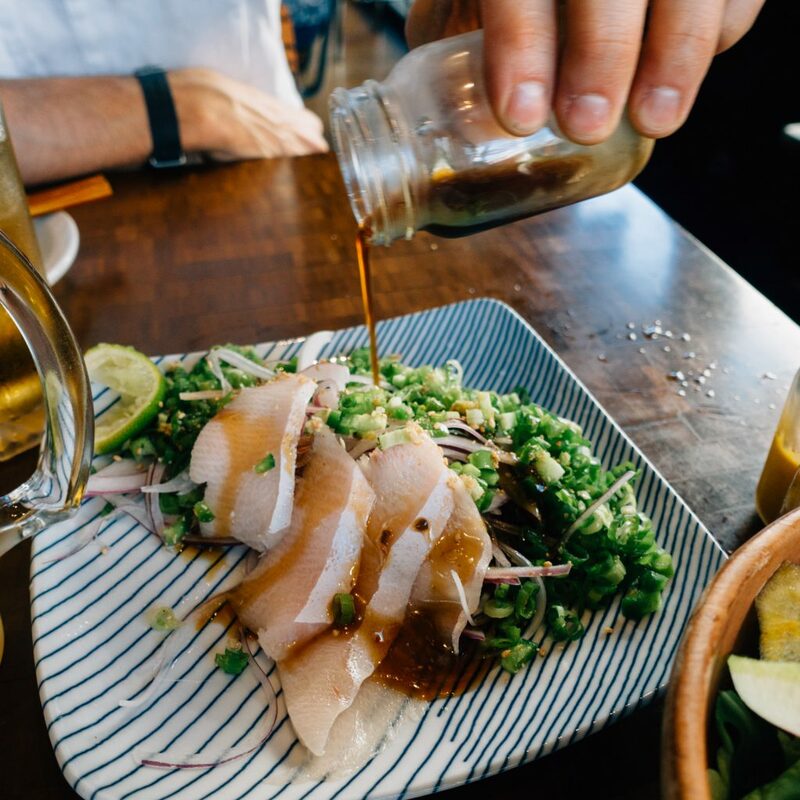 Do not forget to pour on the ponzu! It comes in a little side bottle, and we accidentally started eating the dish before we realized our error. Once we poured the sauce on, it was like unlocking the gates to heaven. 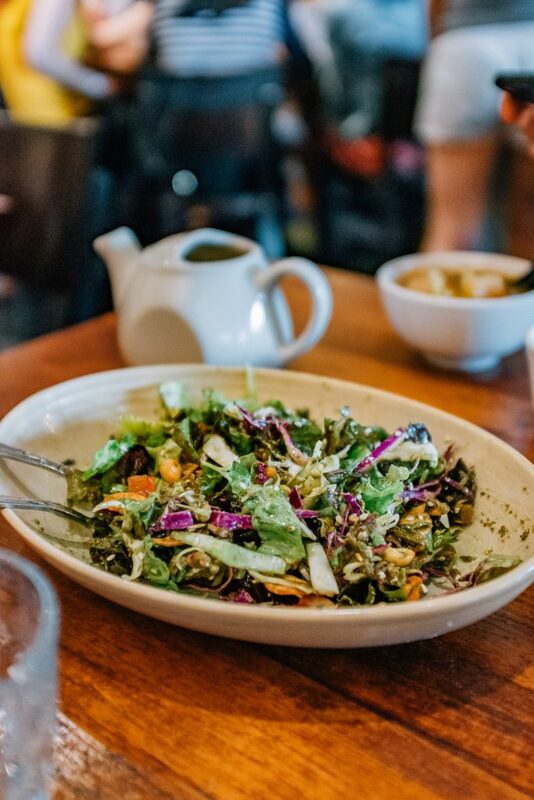 Watch out for those jalapenos – they are hiding in the salad, and if you’re not watching carefully, you could get a mouthful of fire! 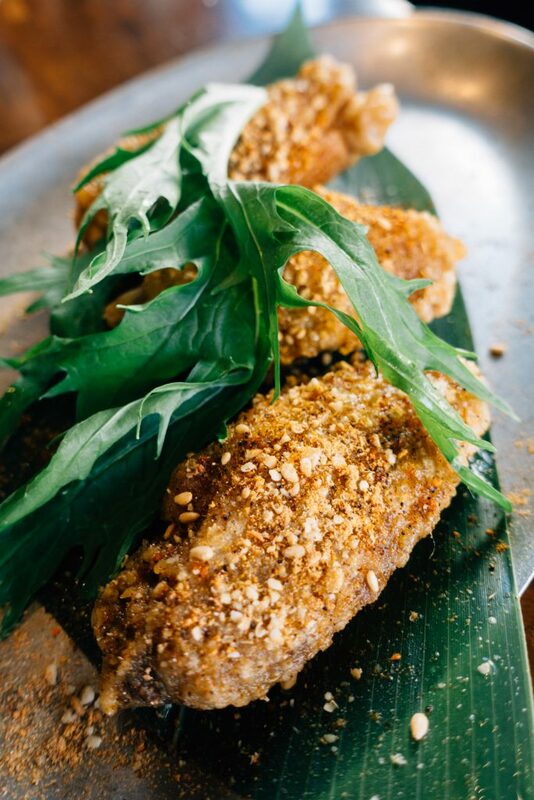 We also tried a new item highlighted on the menu – the Umami Chicken Wings. So delicate and expertly fried, these little guys packed a punch by also having a bit of kick to them. In my mind, the seasoning they were sprinkled with tasted a bit like Old Bay. They were also slightly crispy as well and reminded me a bit of Korean fried chicken, which is clearly a good thing. 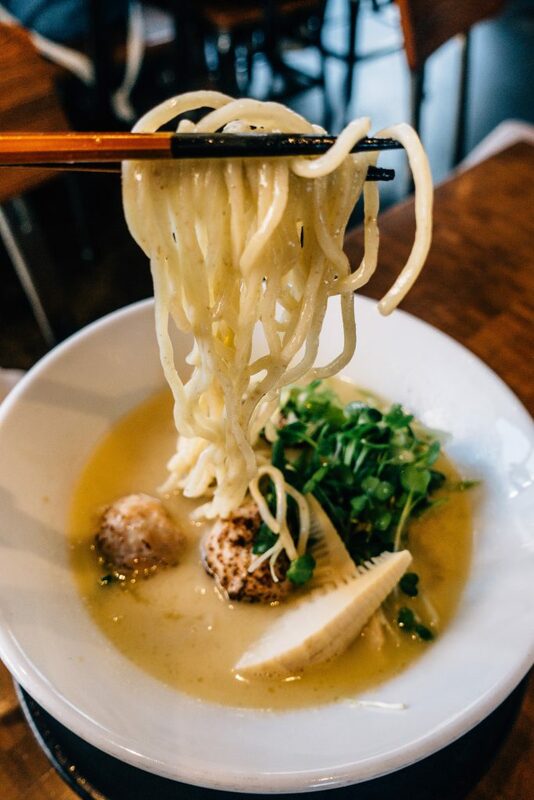 And then there was the ramen… I went with the classic Chicken Paitan ($15) with fluffy chicken tsukune meatballs, daikon sprouts, bamboo shoot, scallion, ginger, and yuzu. 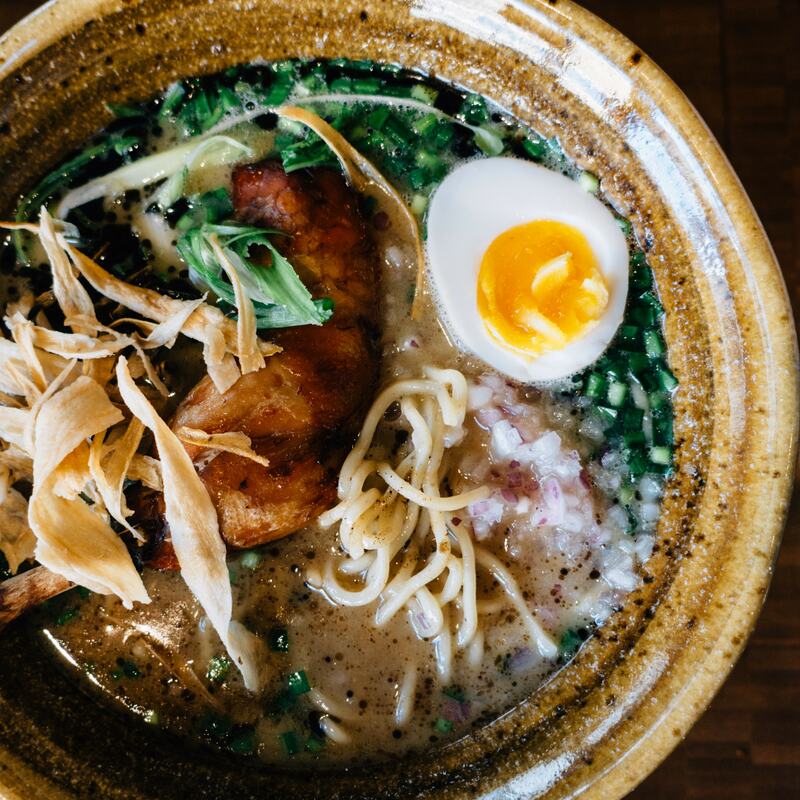 My husband opted for the version that got the most mentions on Yelp, the Chicken Paitan Soy Sauce ($18.50) which comes with an entire slow-braised chicken leg, blackened garlic oil, nira, dashi egg, red onion, scallion, fish powder, and fried gobo. First off, both dishes were some of the most elegant bowls of ramen I’ve ever seen in my life. I gotta say these were classy AF. I fell in love with my Chicken Paitan Ramen. 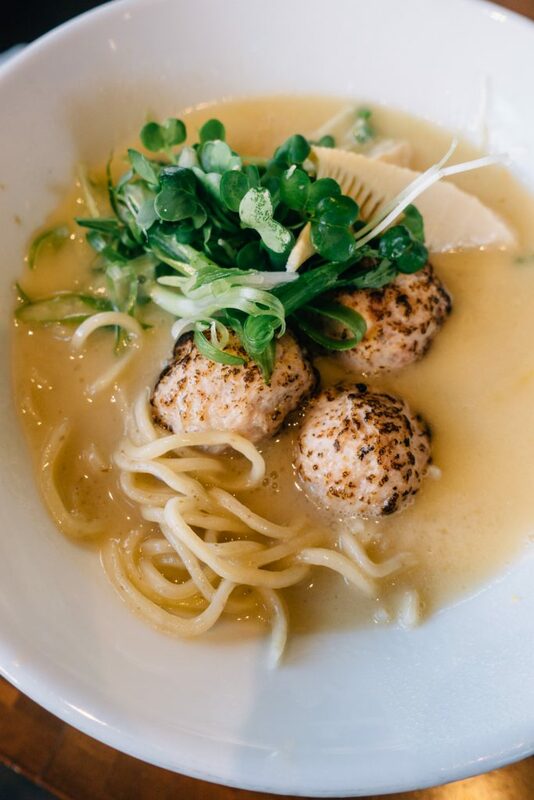 Totally unique – I’ve never had chicken meatballs with ramen before. The meatballs tasted like the wonton soup filling my grandma used to make when she still made wontons from scratch. The balls were beautifully charred on the outside as well. 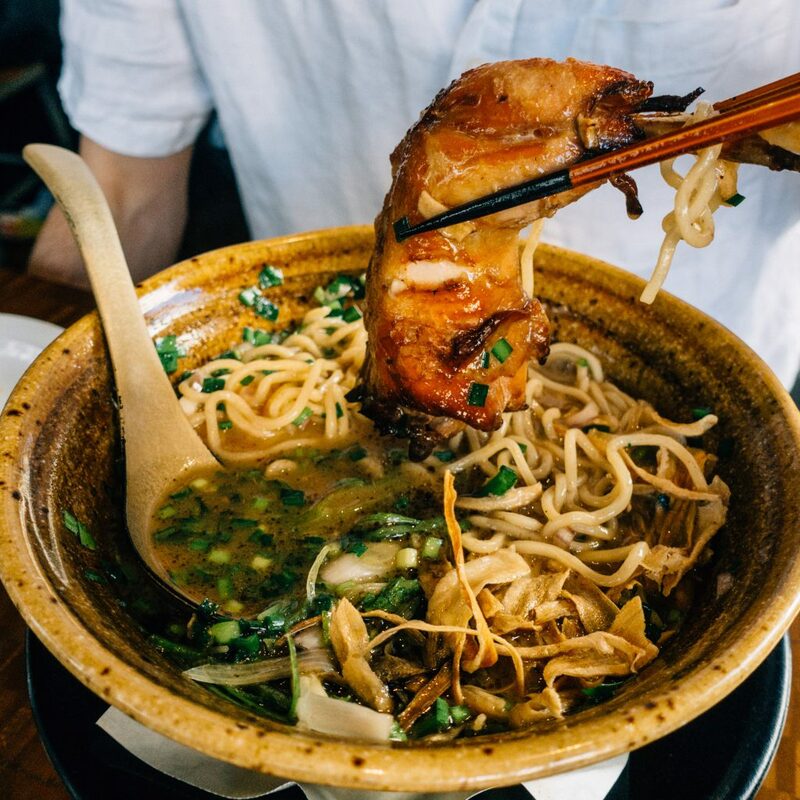 The broth was thick and stewy, sticking nicely to the noodles like a hearty chicken soup. The Soy Sauce Ramen had a much deeper flavor, closer to a tonkotsu, but still had the thick and creamy consistency that I loved in the regular chicken paitan. You really can’t go wrong at this place – everything was delicious! I put a call out to my friends to find out what can’t-miss places I should hit while in town. 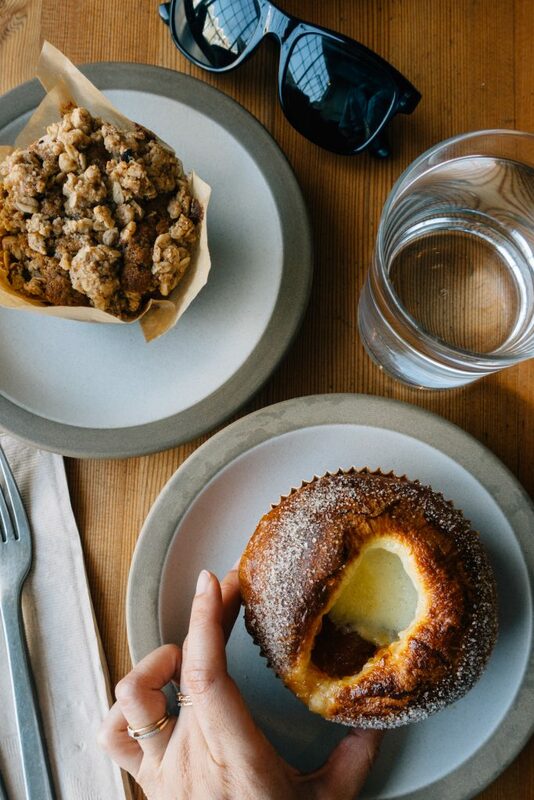 The resounding chorus was to stop by Tartine for breakfast. 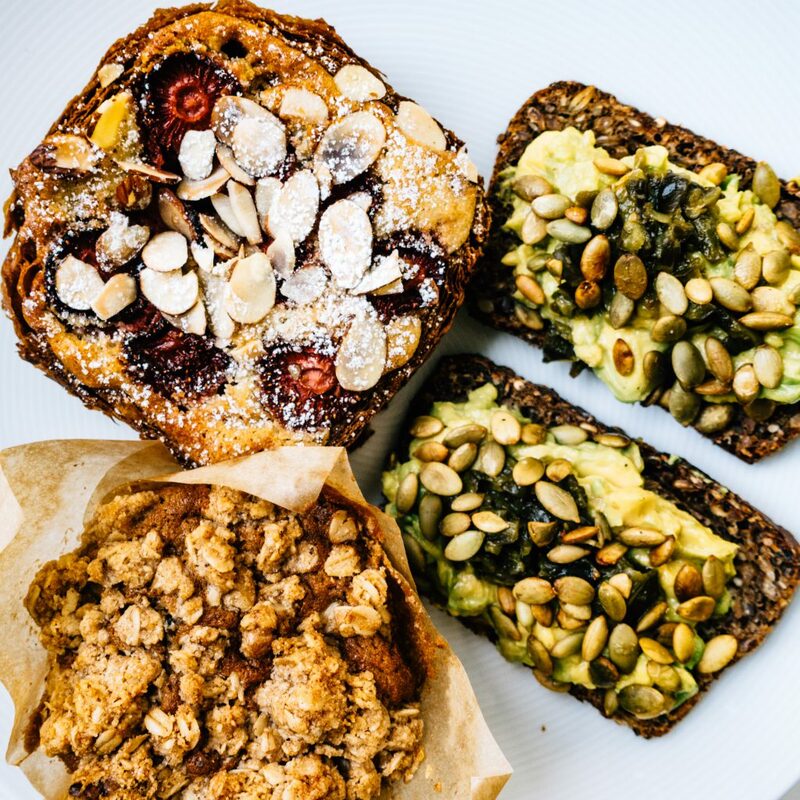 I didn’t end up going to Tartine Bakery (the original location) since Tartine Manufactory was closer to where we were staying and is a newer, bigger space that has been getting accolades (like one of the Best Restaurants of 2017 from Food + Wine and Bon Appetite) and breathless guides written about it since it opened in April. We ended up going twice – once on a Friday around 8:30am and then a second time on Sunday morning around 9. On Friday, we lucked out and were able to order right away. Just 15 minutes later around 8:45am there was a line out the door. On Sunday we had to wait on a line starting outside the restaurant for about 45 minutes before getting to the counter. Everything about Tartine Manufactory is lovely. The space is huge and airy, the dinnerware is a collection of gorgeous creations from Heath Ceramic (who have a store in the same complex), and the food is amazing. The way it works for breakfast is you order everything at the counter and then for any order that has something hot or that needs to be prepared you get one of those buzzy things and you go retrieve it when it’s ready. Seating is first-come, first-serve. I can’t choose a favorite! I ordered the Brioche Jam Bun ($5) the first day and the Bostock ($5.50) the second. Both were amazing. The jam bun has a delicate pastry cream in the middle and is a perfectly light, flakey pastry on the outside. The bostock, with its almond paste and cherries, is filling and delightful. My husband thought the Banana Walnut Muffin ($4) was the best he’s ever had. We also got some Avocado Toast on rye bread. 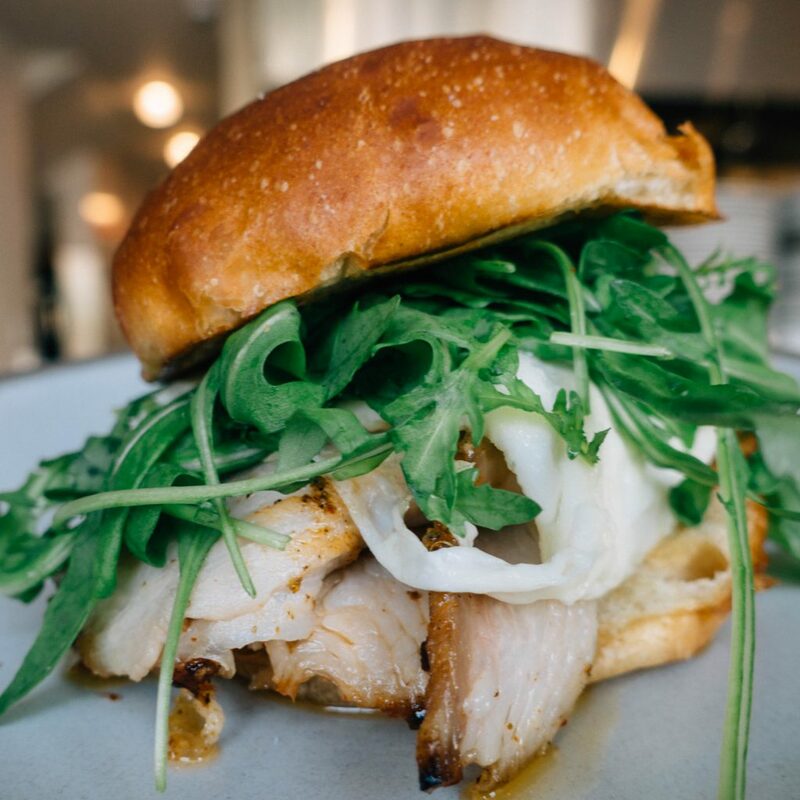 Fresh and good, but my favorites are still definitely the sweets and the porchetta sandwich. Next time I would definitely try out their dinner service (where you can make reservations) and also their ice cream! On our second trip I grabbed one of the incredible PB&J Ice Cream Pies to eat after dinner which Bon Appetit called the Best Dessert of 2017. It’s unbelievably good – sweet and salty and oh so yummy. One pie can feed four people! 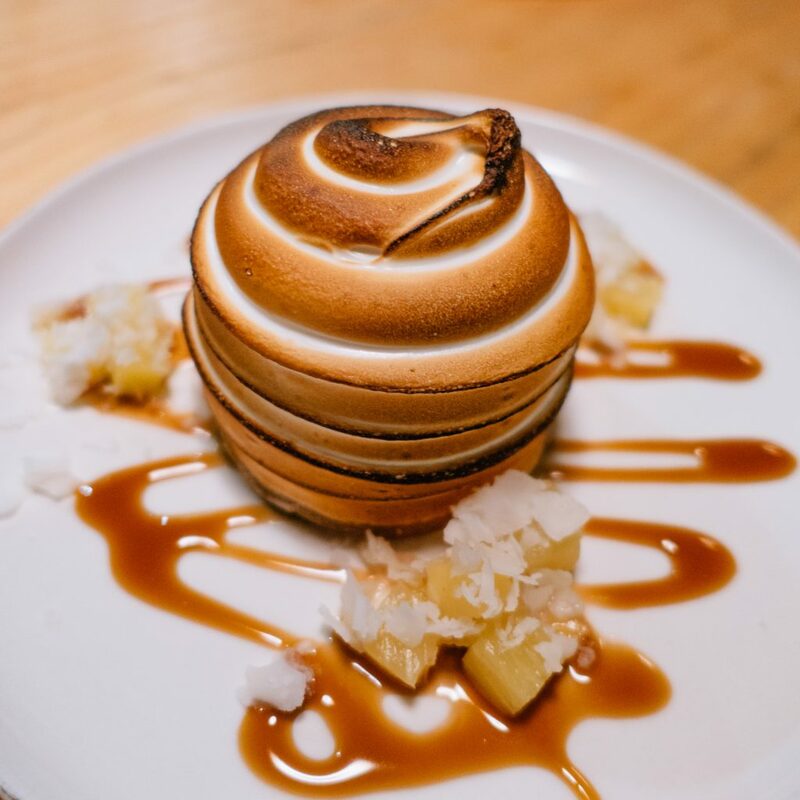 Even though it opened up in 2015 to great fanfare, Liholiho Yacht Club has maintained its cool-kid status and remains one of the toughest dinner reservations in town to secure. Lucky for me, my Bay Area-based cousin snatched up a 10:30 pm Friday night resy for four when I told her we were coming up for the weekend. As an old person, it was a struggle to imagine eating dinner at 10:30 at night, but seeing how numerous people recommended the restaurant to me, I was pretty curious. Started off with a number of smaller dishes like the Fried Green Tomato salad ($15.25) and the Fried Oysters ($14.25), both good. 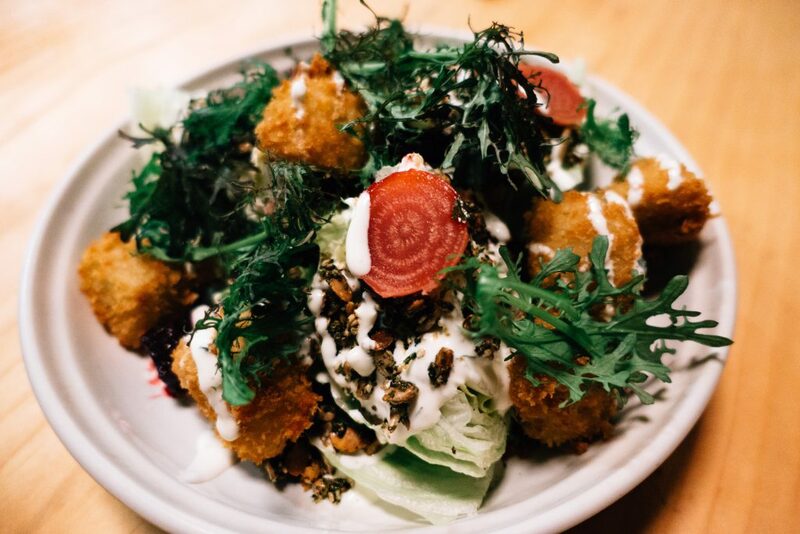 The FGT salad came with an iceberg lettuce wedge and slices of beets sprinkled with furikake crunch and all drizzled with shiso ranch dressing. The tomatoes were fried nicely. 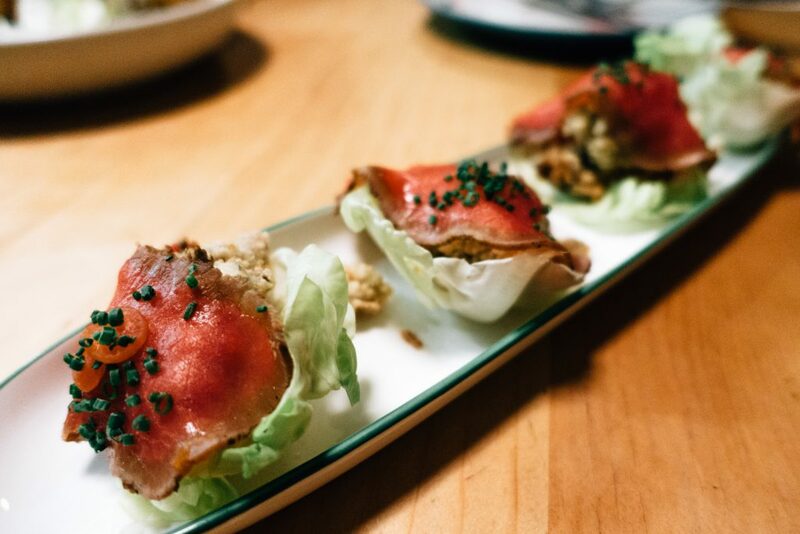 The fried oysters had a smear of 1,000 Island dressing and were layered with beef carpaccio, served in a leaf of butter lettuce. Next, the more hearty dishes came out. First up was the Grilled Shortrib ($42.75). Some yummy meat served on a bed of mushrooms with a side of bone marrow filled with escargot with twice-baked potato piled on top. Then came the other “big” dish, the Cornish Game Hen ($37.25), a really beautiful dish served in a half pineapple. The hen pieces were scrumptious – slightly crispy and full of flavor thanks to the tamari honey glaze. 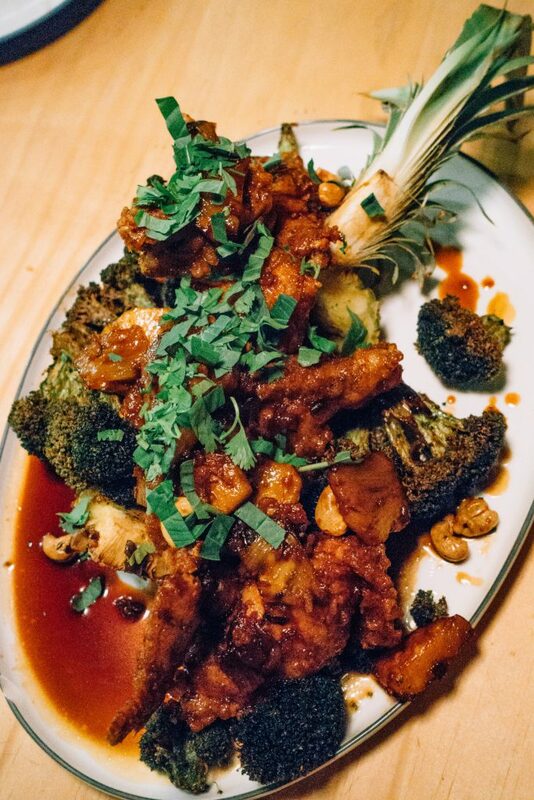 It was all served over a bed of broccoli florets and cashews. Next, my absolute favorite dish, the Fried Rice ($16.25), an incredibly tasty mix of bay shrimp, Spam, and abalone mushrooms. Mmmm… could eat this all day, every day! We did go for some desserts, splitting the Baked Hawaii ($11) and Almond Sponge Cake ($11) amongst the four of us. The baked Hawaii was so pretty, perfectly fired with a caramelized pineapple ice cream inside and a vanilla chiffon. 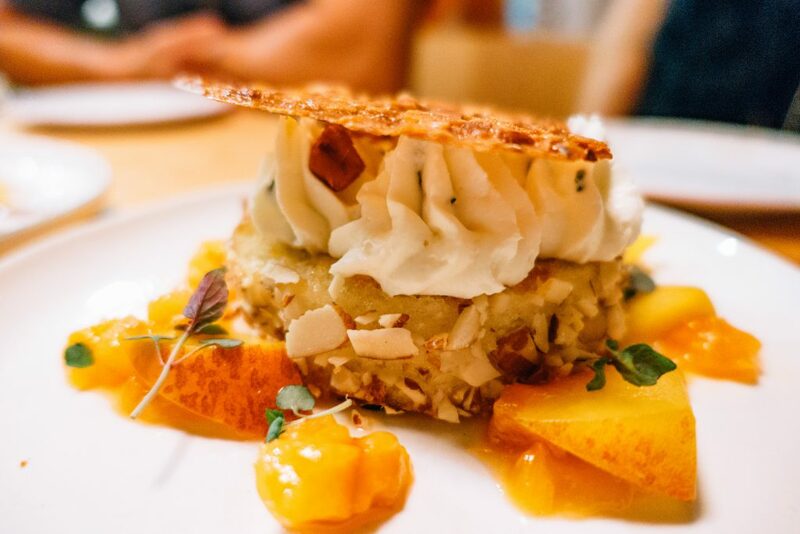 The almond sponge cake was also delightful, with a shisho cheesecake mouse and sweet peach nectarine compote. We headed out to Fisherman’s Wharf early on Saturday and after taking a stroll around the area, I tried to find us a decent brunch in such a touristy area. 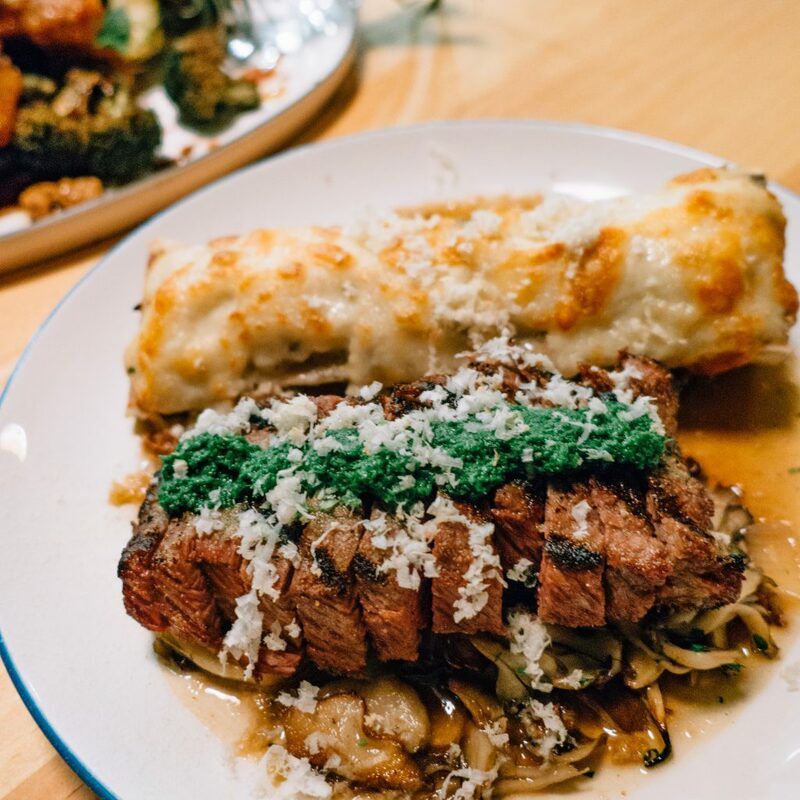 After agreeing not to try to wait on the crazy line at a very popular kitchy brunch spot right by Aquatic Park, I turned to Yelp and found Surisan. 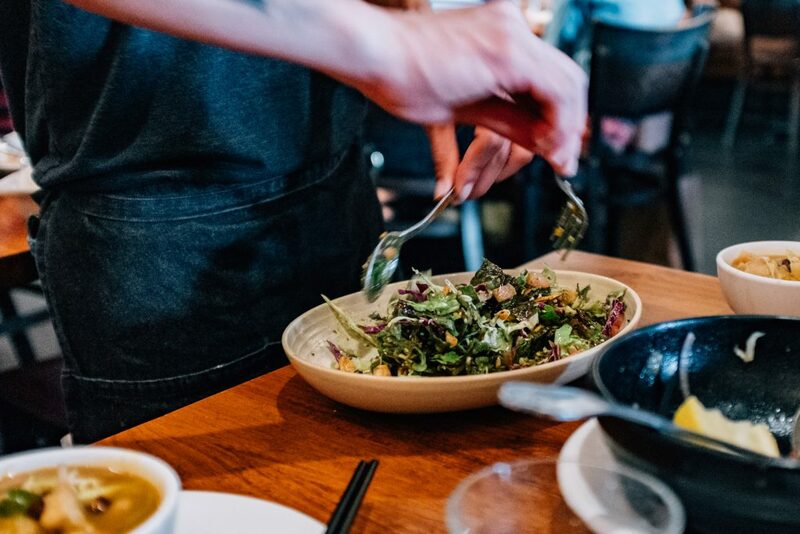 Surisan is a highly-rated Korean restaurant in the area and is an absolute gem of a restaurant. Located in an unassuming corner spot, you walk down into the pleasant little patio lined with lovely plants and flowers. Inside, the restaurant is surprisingly huge, with long corridors filled with tables that seemingly go on forever. However, since it was so freakishly hot the weekend we were there (seriously, it was like 101 degrees), we sat outside on the patio. I ordered the Bulgogi Bap ($16) and the husband ordered the Kimchi Fried Rice ($15). Both were served in black cast iron skillets, with everything still sizzling. 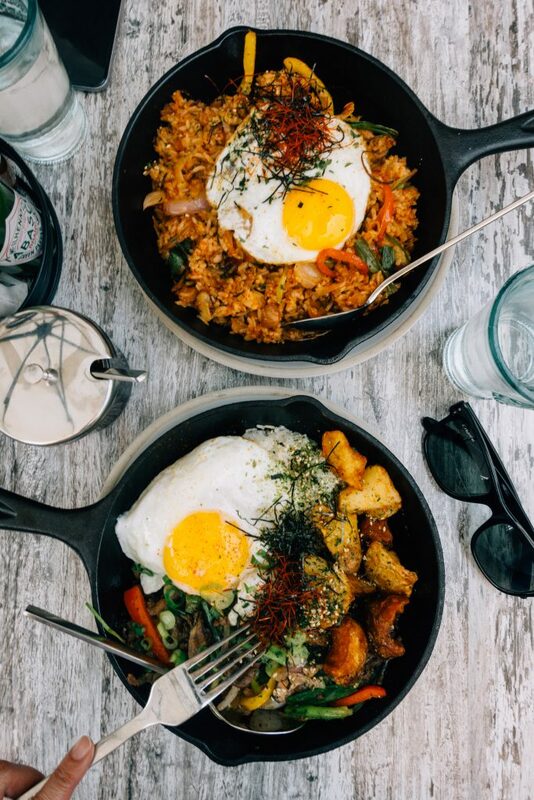 I absolutely loved my bulgogi bibimbap with its tender marinated beef pieces on top of some yummy sticky rice, Yukon potato home fries, and fresh veggies topped with a fried egg. While we were visiting there was a crazy heat wave so we stopped by Smitten Ice Cream for some ice cold sweets. 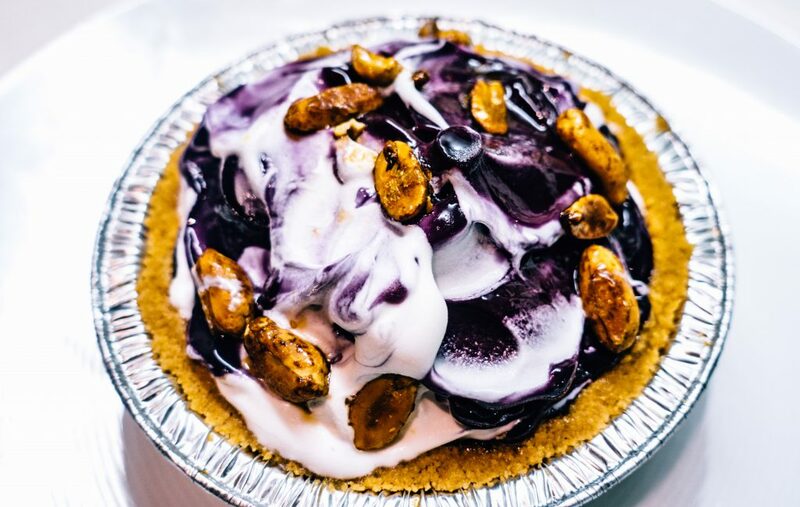 Known for its made to order and frozen with liquid nitrogen, making the creamiest, smoothest ice cream you’ve ever had. 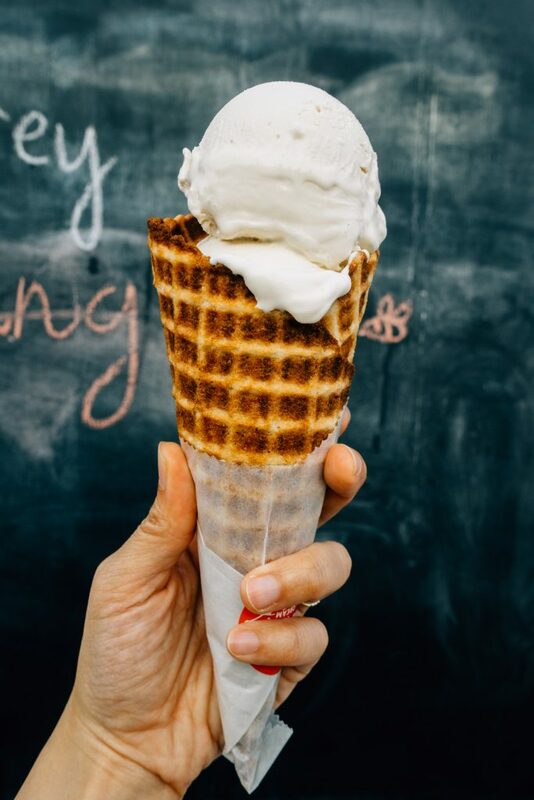 Earl Grey flavor in a classic waffle cone was delicious! 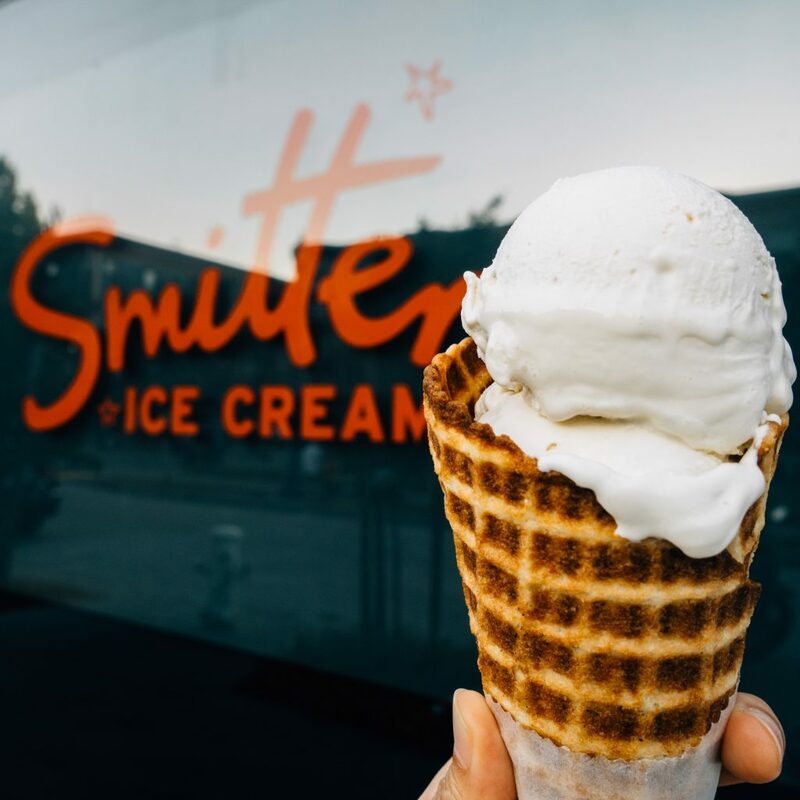 Super smooth ice cream from Smitten. 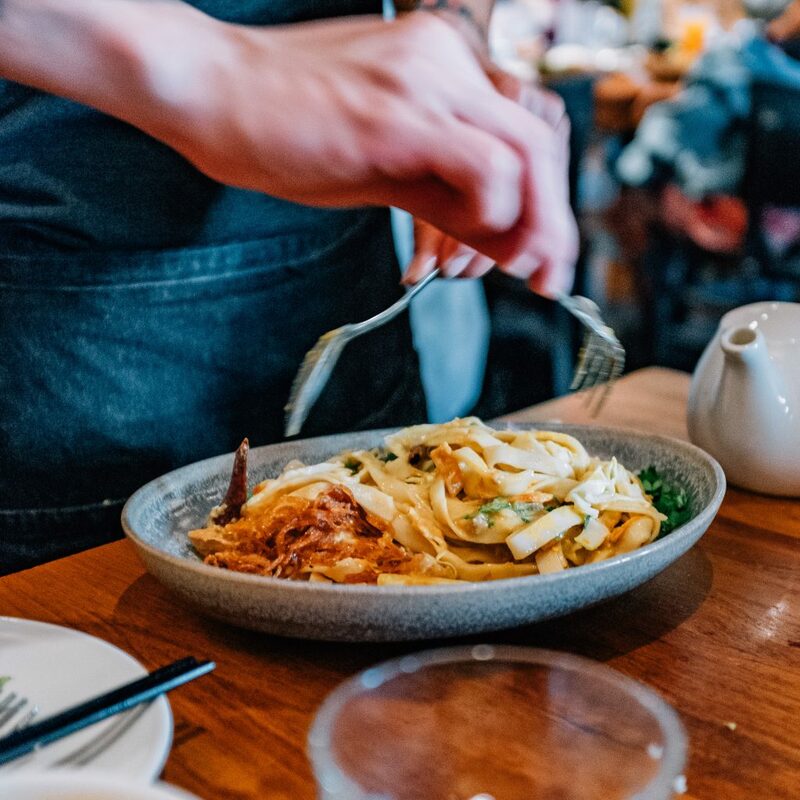 Located in the Richmond District in the northwest pocket of San Francisco is the well-known and well-reviewed Burmese restaurant, Burma Superstar. It made for the perfect spot to get a late lunch after visiting the De Young Museum. 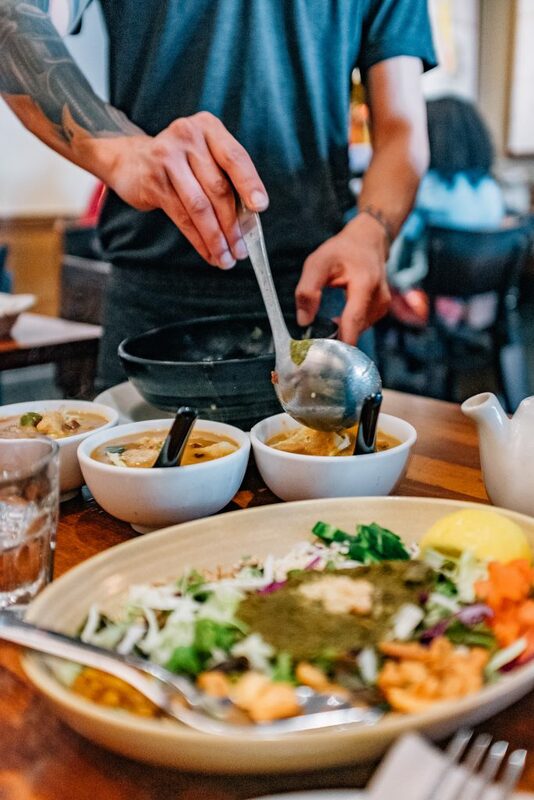 Pouring Vegetarian Samusa Soup into bowls. 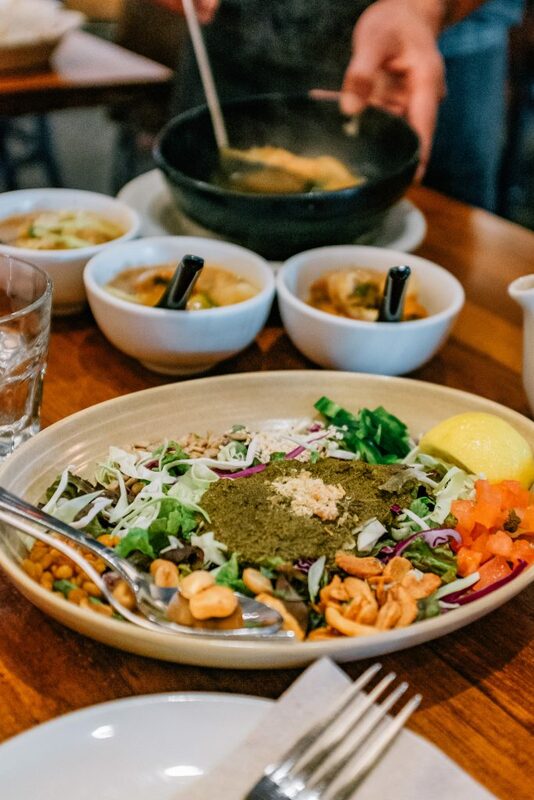 Everything we ordered was fabulous – from the Vegetarian Samusa Soup to the restaurant’s famous Tea Leaf Salad (a mix of greens, nuts, and veggies). 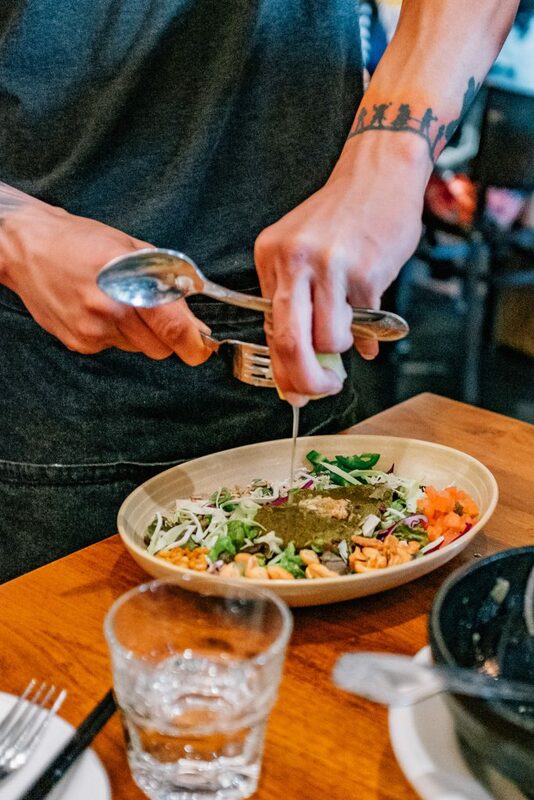 When a number of our dishes came out, a server would do a table-side mixing of the ingredients, which was a lot of fun to watch. The Tea Leaf Salad after being tossed. PRO TIP: Burma Superstar is known for its long lines. 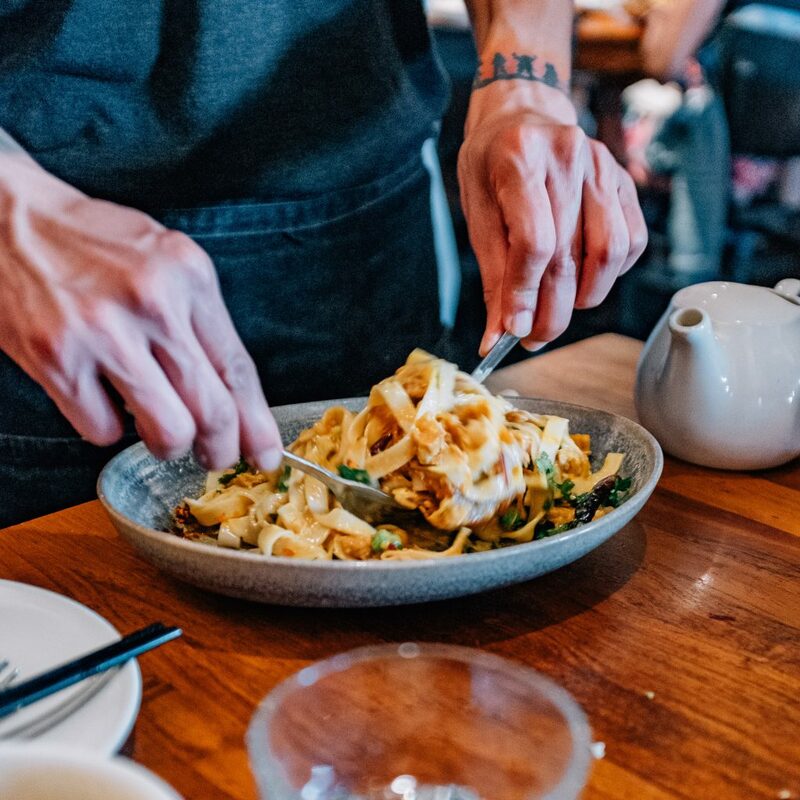 Put your name on the waitlist BEFORE arriving by using Yelp’s waitlist feature for the restaurant. This worked out perfectly for me since the De Young Museum is a 20 minute walk to the restaurant. By the time we arrived, my name was at the top of the list. I checked in with the host once we got there and just five minutes later we were seated. Sure beats hanging around outside for a while! 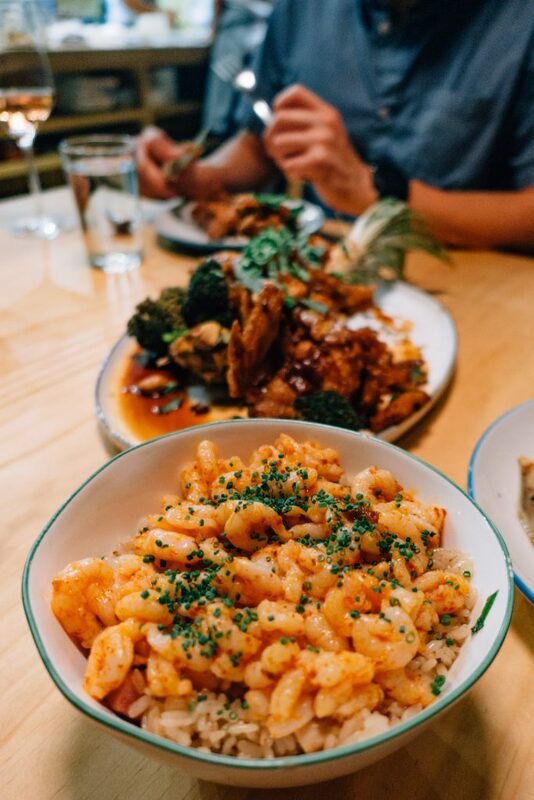 Hope you enjoyed my guide to eating in San Francisco. Let me know what other places you recommend by leaving your thoughts in the comments! Wow this is an incredible guide! I knew we had to visit Tartine bakery but didn’t know there were 2 locations. So glad you liked it Monica! Hope you’re having a wonderful time in SF!